Yes, 1,000 emails a day. 30,000 emails a month. I follow the #DDD principle which stands for Do, Delegate, and Delete. We practice this company-wide along with the rest of our 9 triangles. 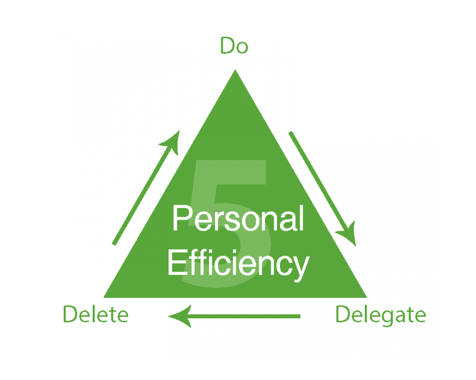 Do, delegate, and delete is our personal efficiency triangle. I archive (delete) most items right away. Delegate is when I pass the email off to someone else because they’ve made a mistake, I need to nudge them, or they’ve lost track. This happens often with young adults in our company. Having to do it yourself is the most expensive part because now you are putting in your own time. Some of these things you can’t avoid. The more you can delegate or delete, the more efficiency you are able to get. If you are running a team I would practice #CID, communicate, iterate, or delegate. This is similar to #DDD. Communicate is just giving lightweight touches to make sure people know what is going on, having updates, and project management. Iterate is when you have to do the task yourself- which should be rare. Delegate is passing it off to someone else because you have a process around the task that they can follow. Having a process and checklist makes things easier to delegate and saves everyone time. Without a process, you run into a lot more questions, unfinished tasks, or the task will be done wrong. I go through my email twice a day, mid-day and at night. During the day, I’ll use the gmail app to process quick replies, delegating out urgent items or handling myself, so I don’t have to address twice or remember. Handle things quickly without hurrying or rushing. Be quick, but don’t rush, there is a difference. Email should not be the kind of thing you are trying to catch up with. You are able to get it done in a couple sessions per day so that you can have the majority of your time as free time to be able to think. You are trying to be proactive, not reactive. The more of a leader you are, the more important it is to have time that you can actually plan. You should never allow your inbox across Facebook, Linkedin, Gmail, or Twitter to overwhelm you. It should never take more than half your time. In fact, I run everything through a single inbox, since having multiple inboxes via Facebook chat, LinkedIn chat, text, Basecamp, and other systems just creates more clutter. I archive most my emails right away because they are automated emails I get daily. I do everything I can to save time such as using boomerang, change settings to advance forward to the next email after I click archive, and delegating. I don’t use folders, star emails, or save things. I follow GTD, get things done, to maximize personal efficiency in getting things done the first time. Then I know that I don’t have to go back and reread it. If I have to go back, I can always search for it. Boomerang is my favorite product, it’s $10/month. I use this when delegating task from emails out to our people. I can boomerang the email to come back in a certain amount of time to make sure the task got done. Set boomerangs to only come back if there is no response. I always boomerang out twice as long as the due date. This way I’m not getting more emails prematurely. For example, if a task is due in 2 days, I boomerang it out for 4 days, Hopefully, I get the email back before then, meaning it got taken care of in time. If I’m getting a lot of boomerangs back then something is wrong. Only use boomerang if you have to. If you can get something done right away, then do it. Always practice GTD first, unless you are delegating it out. You have to become a pro at Gmail in order to fully maximize your productivity. Unless you are only getting a few emails a day, you won’t be able to get through your gmails if you don’t know how to use it. We always have an internal thread for iterating on projects. This way we are not iterating through email where things can get lost in a hurry. Every email I open only takes a 30 sec- 2min to take care of. If there’s anything that takes more than 15 min, you got to wonder if it is something you really should be doing. Think to yourself, “am I doing things efficiently”. If a specific email thread has good velocity then you know that project is doing well. If there are gaps of more than 3 days then you know there is a lack of communication, momentum, and production. Then I end up having to chase people. Don’t try to use a bunch of folders to sort emails- it won’t work. I don’t know anyone who has had long-term success using folders. By the way, I’m using the free emailmeter tool to help me understand my email efficiency. This will help you gauge how you are doing. When you take care of things one time you don’t open emails, close them, sweep them into folders, labels, or pads. Handle everything at one time. If you are going to read it, then read it, You won’t have time tomorrow, don’t fall into this lie everyone uses.